Unfortunately, many people think that redacting text is accomplished by drawing black boxes on top of text using PDF annotation tools. Although it looks very similar to redaction, drawing black boxes over text or images does not prohibit the recipient from copying the text or graphics underneath the black boxes and pasting it into a new document, thus revealing the information that should have been redacted. In other words, even if you can't see the information, it's still there and it's easy for a user to copy it. There are any number of horror stories related to sharing PDFs containing privileged information that was not properly redacted. For example, in 2008, a TSA employee failed to properly redact a 93-page operating manual detailing TSA screening procedures. The manual was posted on a government-procurement website where with a simple copy and paste anyone who was interested could read about which passengers are more likely to be targeted for secondary screening, who is exempt from screening, TSA procedures for screening foreign dignitaries and CIA-escorted passengers, and extensive instructions for calibrating Siemens walk-through metal detectors. 1. Open the document you’d like to redact. Move to the Tools pane and select Protection. From the drop-down menu select Mark for Redaction. 2. Using the cursor, select the document or images you want to protect. Once done, the text or image will be surrounded by a red border. If you hover the cursor over the area now, you can preview how the document will look after you apply redaction. 3. Click on the Redaction Properties option. Here you can alter the settings according to your preferences. The default redaction area fill color is black, but you can change it to anything you like, or no color at all. 4. If you’re working on a large document, you can click on the Search & Remove Text option to search for the text. A window will open on the left side of your screen. From there you can search for dates, phone numbers, email addresses, social security numbers, etc. After the search is complete, you can redact the text according to your preferences. 5. Click on Apply Redactions. Acrobat will ask you if you’re really sure you want the material gone. Note: The items aren’t permanently removed from the document until you save it. 6. Click OK and the text will disappear forever. 7. Acrobat will then ask you if you would also like to find and remove any other hidden information. You should always say yes to this. Acrobat is asking if you want to remove the metadata, and you always want to remove the metadata. Scrubbing the metadata ensures that any author information, revision history, document summary or any similar information gets completely excised from the document. 8. Choose File > Save and specify a filename and location. The suffix _Redacted will be appended to the filename. If you don’t want to overwrite the original file, save the file to a different name, location, or both. Remember, it’s not enough to simply select text and change the highlight color to black, like this: . Otherwise, you can just copy the text in that black box to see what it says. A PDF works the same way, so to permanently remove text from a PDF you must use the redaction tool. Sometimes, when sharing sensitive documents with third parties, such as during M&A due diligence, redaction is not the right tool. The parties you’re sharing documents with will need to see private or sensitive information in order to make an informed decision about your transaction. This could include financial information, employee records, manufacturing processes and IP. When sensitive information needs to be shared with third parties transparently, but still remain secure, it becomes necessary to employ a virtual data room. Virtual data rooms not only organize materials, so they are easy to find and review, they also keep documents secure. Modern virtual data rooms allow administrators to grant different individuals different levels of access to the data room and enable them to place varying degrees of protection on individual documents such as dynamic watermarks, expiration dates, and the ability to disable saving, printing and copy/paste. Good virtual data rooms can even disable screen shots and have the ability to “remotely shred” documents, even after they’ve been downloaded. 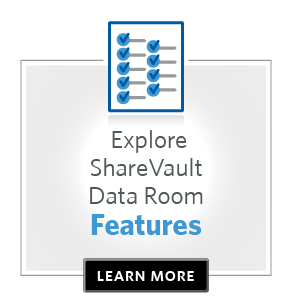 To learn more about how modern virtual data rooms are the right tool for securely sharing business critical documents with third parties, click here.